Are you looking for a weekend getaway from Jaipur? If yes, then you must consider visiting and exploring the expanse of Sawai Madhopur, which is home to natural as well as historical sites. It is one of the significant cities in Rajasthan and is known for Ranthambore National Park, which is located on its outskirts and is known for the population of tigers. Therefore, it is also called the Tiger City of Rajasthan. The history of this beautiful city dates back to the middle 18th century when it was constructed by Maharaja Madho Singh as a planned city. Today, it has become a tourist spot and is visited by tourists from all over the country. From temples to forts and parks to lakes, there is a lot to savour here. So, what do you think about a trip from Jaipur to Sawai Madhopur now? Read on to learn in detail about this tiger city and how to reach it. With a subtropical and dry climate, the region of Sawai Madhopur experiences hot summers and cold winters. Therefore, it is not a preferred destination during the summer season when the temperature is above 40°C. The best time to visit Sawai Madhopur is from late October until the end of February. During this period, the surroundings are blessed with the best of lush greenery and a pleasant weather. By Air: The nearest airport to Sawai Madhopur is Jaipur airport at a distance of about 140 km. Hence, there is no option available to travel by air if you are starting your journey at Jaipur. The best way is to hire a direct cab to Sawai Madhopur. By Rail: If you are looking to travel by rail, then can catch a direct train from Jaipur railway station to Sawai Madhopur Junction. It will take you an approximate time of 2 h to reach your destination by rail. By Road: Sawai Madhopur is well connected to Jaipur and other major cities. Hence, you can approach it easily by road. It is advisable to take route 1 as it will take half an hour lesser in comparison to the other route, thereby, taking you to your destination within 3 h. On your way, you can also visit Chaksu and explore the beauty of its temples. Chaksu is located at a distance of about 41 km from Jaipur and 105 km from Sawai Madhopur and is famous for its beautiful temples. Even though there are not many places to explore here, it is still frequented by numerous travellers everyday. The major places here include Sheetla Mata Temple, Barkhera Jain Temple, Ram Mandir and Champeshwar Mahadev Temple. You can also visit Golirav Talab and Manohara Talab. So, what do you think about a break at Chaksu? If there is any place on your way from Jaipur to Sawai Madhopur where you can relax, then it is certainly Chaksu. Sawai Madhopur is located at a distance of about 150 km from Jaipur and is blessed with numerous tourist spots. Following are the major places which one cannot afford to miss visiting while in and around Sawai Madhopur. The most visited tourist spot in Sawai Madhopur, Ranthambore National Park is one of the largest national parks in India and is visited by tourists from all over the country. It is one of the few places where you can easily spot Bengal tigers in their natural habitat. Established in the year 1980 and spread over an area of about 282 sq km, this beautiful national park is home to several beautiful species of plants and animals, such as Indian leopard, sambar, wild boar and striped hyena. Over a period of time, Ranthambore National Park has become an identity of Sawai Madhopur. The park is also home to several lakes and historic sites. The most famous and highly revered temple in Sawai Madhopur, Trinetra Ganesh Temple is a must-visit destination for you. The largest fair in Sawai Madhopur, Ganesh Chaturthi Fair, is celebrated at this holy temple. As per local legends, the temple is said to be centuries old; therefore, it is also visited by numerous history lovers. Another beauty of Sawai Madhopur without which your visit to this tiger city is certainly incomplete, Ranthambore Fort, is located within the boundaries of Ranthambore National Park and was established by a Chauhan ruler. Even though the exact year of its formation is still a debatable topic, it is believed to have been constructed in the late 10th century. 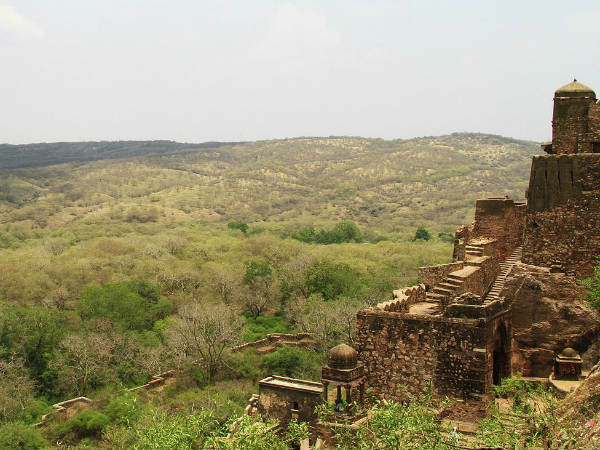 Surrounded by beautiful hills and richly diverse wildlife, this beautiful fort is a must-visit spot if you are looking to explore the history of Sawai Madhopur. The fort houses several temples and palaces. You can also explore its nearby lakes and valleys. If you are not satisfied even after exploring the above-discussed places, then you can also plan a tour of other sites, which include Kala-Gaura Temple, Shilpgram, Rajiv Gandhi Regional Museum of Natural History, Ghataliya Balaji Temple and Galta Mandir.